Born - 1909 Rudauli,Barabanki , UP, India. Majaz was born in Rudauli, Barabanki,UP, India. He received his early education in Lucknow and Agra, and did his B.A. at Aligarh Muslim University. He considered Fani Badayuni as his 'ustad'. He hails from a family of poets and litterateurs. 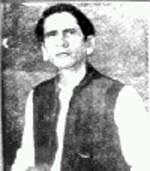 Muztar Khairabadi ,one of the great masters of Urdu poetry, was among his ancestors.He has a sister Safiya, who married to Jan Nisar Akhtar, father of Javed Akhtar. Majaz started writing poems while in Aligarh and soon became a popular among the masses and well respected among the literati. He became one of the front-ranking poets of the taraqqi pasand tahreek or Progressive Writers’ Movement. He is also well-known for composing the anthem, tarana, for Aligarh Muslim University, 'Ye meraa chaman, hai mera chaman, Main apne chaman ka bulbul huun.' "Aahang" and "Saaz-e-Nau" are two of his poetry compilations. Majaz was madly in love with a woman. She married another man which he could not come to terms with. His poetry was greatly influenced by her and he remained unmarried all his life. Majaz, a heavy drinker, died alone in a tavern located in the Beldari Lane of Lalbagh, on the cold winter night of 5 December 1955 in the heart of the city of Lucknow. Majaz ke isii majmue ki pahlii Ghazal pesh-e-Khidmat hai. ab mere paas tum aayii ho to kyaa aayii ho? This is the complete nazm of Majaz titled “nazr-e-aligarh” written in 1936. It was later abridged and adopted as the lyrics of A.M.U. Tarana. Rah-e-ishq main rah_numaa chaahataa hoon. Ye kya chaahataa hoon ye kyaa chaahataa hoon. Sazaa aur aisii sazaa chaahataa hoon. Mazaa hai Khud gum huaa chaahataa hoon. its very beautiful iam one of the fun of Majaz Lucknavi khaas kar unke poetry ka. nice bhai making such kind of blog.